ACP’s evidence-based public policy positions form the foundation for the College’s advocacy efforts. Our policies determine what issues we advocate on to Congress and the federal government; they also determine the stances we take on those issues. 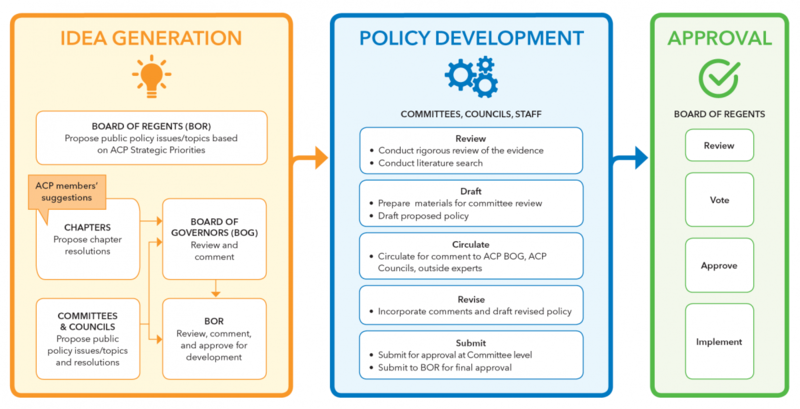 Click to expand and view the policy development process, or download it. ACP’s policy agenda is developed with the goal of advocating for what is best for patients as well as the profession, taking on a comprehensive array of topics that represent the depth and breadth of the wide-ranging issues that impact medicine and specifically internal medicine. Each year the Board of Regents (BOR) establishes priorities that guide the focus of ACP staff, and the BOR’s committees and councils. And, Governance and staff follow developments in healthcare to adapt the College’s priorities and positions as needed to best achieve our mission of improving the quality and effectiveness of healthcare. Where does ACP policy come from? A policy itself starts with an idea. This idea can come from the priorities established by the BOR, or it can be brought forth to the College governance for consideration. That idea can be brought as a resolution from an ACP chapter, by way of suggestion from individual chapter members, which is then presented to ACP’s full Board of Governors by the chapter’s Governor. Policy ideas can also be generated via suggestion by one of ACP’s committees, councils or staff. Our process, which combines member input from the chapter level on up through the Board of Regents, in representing ACP members, provides multiple opportunities for ACP Leadership, in representing the interests of ACP members, to engage and comment. ACP is committed to a transparent process of review. How do we develop a policy once a topic is identified? The Health and Public Policy Committee (HPPC) develops ACP's positions on issues affecting the health care of the American public and the practice of internal medicine and its subspecialties. Policy on payment, quality and other regulatory issues are developed by the Medical Practice and Quality Committee (MPQC). Ethics policies are developed by the Ethics, Professionalism and Human Rights Committee (EPHRC). Membership on the committees includes a diverse mix of generalists and specialists, academics and private practitioners, ACP Regents and Governors, and representatives of ACP councils. Special attention is paid to assuring that the diversity among ACP members is represented. The first step for a committee is for ACP staff to conduct a literature search and review of the evidence and prepare background materials for the policy committee members to review. Our policy is developed through a rigorous review of evidence, considering what works and doesn't work to improve patient care. Committee members then meet to discuss the literature review and background and provide input to ACP staff. Next, draft policy papers are written for committee review and discussion. The committee votes on whether or not to approve the paper. Following initial committee approval, a draft policy paper is circulated for comments to ACP governors; regents; chapters and their health policy committees; and, the ACP councils representing subspecialists, students, residents/fellows and early career physicians. At the same time a confidential draft of the paper is sent to select outside experts for their input. All comments and proposed revisions are shared with the policy committee for their consideration and they determine the final version of the paper going forward for approval. The final step is for the paper to be sent to ACP’s Board of Regents for a vote. The Board then takes up the final paper for consideration and votes on whether to approve it as part of the College’s official policy record. How can members participate in our policy development? Our process seeks to represent the diversity of member views and experiences in the policy development process. Through ACP’s chapter and governance structure, elected leadership brings forth resolutions often suggested by members. Ways to get involved include engaging with your ACP chapter, letting your Governor know your views, providing feedback on ACP Member surveys if selected, and volunteering to be considered for appointment on ACP policy committees and councils.